Mike Alameda was born in Tucson, Arizona, in 1960. He grew up in one of the oldest Hispanic communities in Tucson. He attended local area schools and graduated in 1978. He began working in a print shop at the age of 17 and was involved in the printing and graphics arts field for 16 years. At the end of 16 years, Mike had become vice president of a nationwide company that specialized in cultural products that were sold to the federal government and Fortune 500 companies worldwide. After six years as vice president, Mike felt God’s call to leave his position and become a missionary with a non-denominational ministry call Vela International based in Mexico City. 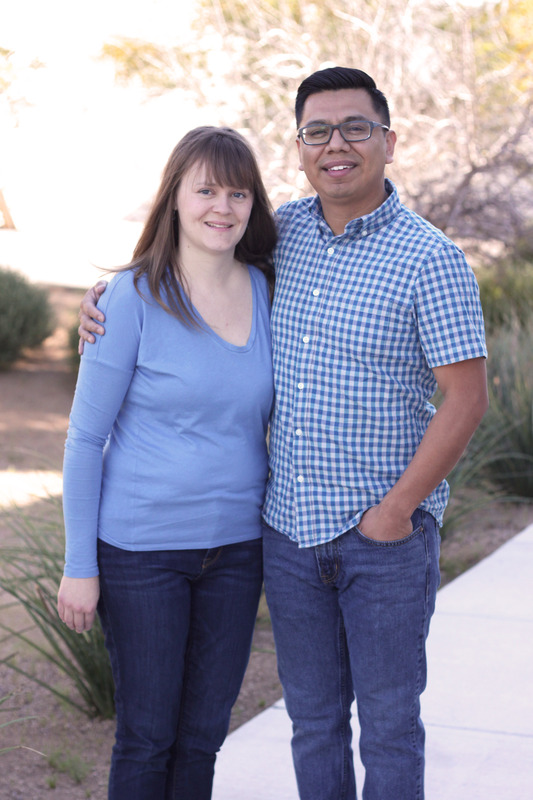 Although the ministry was in another country, Mike and his wife Claire were called to reach the Hispanics and other ethnic populations in Tucson. After a year in ministry, and with Vela International’s blessing, Mike and Claire founded the Tucson-based Corazón Ministries in 1994. The mission of Corazón is to evangelize non-believers, to develop believers into disciple-makers, and to equip believers for work and service within the context of culture and community in Hispanic/Latino and other ethnic populations. After over twenty years of ministry, Corazón has become a nationwide ministry reaching Hispanics/Latinos and other ethnic populations in the United States and is in the process of equipping Hispanics to participate in sharing the gospel throughout the world. To listen to Mike's podcasts click on the link! The mission of Corazón is to evangelize non-believers, to develop believers into disciple makers, and to equip believers for work and service within the context of culture and community in Hispanic/Latino and other ethnic populations. Claire Alameda was born in Los Angles, California. She accepted Christ as her Savior just after she graduated from high school. Claire received a Bachelor of Arts degree in political science from the University of Arizona in 1985. The same year, she met and married Mike Alameda. Claire began her career at the University of Arizona in student services. She specialized in the recruitment and retention of ethnic minority student populations. Although experiencing a successful professional life, Claire, along with her husband, felt God stirring her heart towards missions. In 1992, the Alamedas were commissioned and sent as missionaries to the Hispanic/Latino communities in the United States. Together, Mike and Claire founded Tucson-based, Corazon Ministries. Claire serves as the Director of Women’s Ministries. The Women of Heart program reaches out through evangelistic home Bible studies, discipleship and mentoring, leadership training, mom’s classes, monthly cafe gatherings and an annual women’s retreat. Claire’s passion is to meet women where they are and to touch them with the truth of God’s Word and the love of Jesus. Claire loves to share a cup of tea and good conversation with family and friends around her dining room table. Mike and Claire live in Tucson Arizona. They have three children, two sons and one daughter. Claire serves as the Director of Women’s Ministries. The Women of Heart program reaches out through evangelistic home Bible studies, discipleship and mentoring, and more. Enrique was born and raised in Mazatlán, Mexico. He moved to Tucson shortly after giving his life to Christ in 2007, when he was 23 years old. He earned a bachelor's degree in communications studies from the Western Institute of Technology and Higher Education in Guadalajara, Mexico. In the summer of 2012, Enrique completed a six-month missionary internship with Corazón Ministries. After that time, he received God’s calling to a life of missions and ministry and to reach Hispanic/Latino communities for Christ. Enrique was commissioned as a missionary by his home church in February of 2013. Enrique now serves as a missionary and the Director of Spanish-Speaking Ministries at Corazón. His passions are to help believers grow through one-on-one discipleship and to build personal relationships. He desires to share the Gospel through evangelistic homes Bible studies and cultivate unity in the body of Christ by breaking down cultural and denominational barriers. Enrique and his wife, Lorena were married in November of 2013. Enrique now serves as a missionary and the Director of Spanish-Speaking Ministries at Corazón. His passions are to help believers grow through one-on-one discipleship and to build personal relationships. Alberto and Stephanie met in 2003, as they helped organize Corazón Ministries’ Spanish-speaking missions conference held in Tucson, Arizona. This was Alberto’s first exposure to Corazón Ministries, while Stephanie was already serving as a missionary there. Two years later, in 2005, Alberto and Stephanie married and continued to serve at Corazón as team leaders in the areas of evangelism and discipleship. Over the next several years, Alberto and Stephanie led a variety of Bible studies which confirmed their desire to serve God in a full-time capacity. Alberto gained substantial experience in worship ministry at their local church and throughout the city, as well as in the private sector. During the first 10 years of marriage, God blessed Alberto and Stephanie with three sons. Alberto and Stephanie made the decision to join Corazón Ministries as missionaries and were commissioned by their home church in August 2015. They desire to reach Hispanic/Latino communities in the United States with the Gospel of Christ and to equip the Church for works of service. Alberto, who is bilingual, directs the men’s and music ministries at Corazón and works directly with missionaries Mike Alameda (Corazón Ministries Director & Founder) and Enrique Garcia (Spanish-Speaking Ministries Director). Alberto gained substantial experience in worship ministry at their local church and throughout the city, as well as in the private sector. Naomi was born and raised in Tucson, Arizona and gave her life to the Lord after praying to receive Christ with her kindergarten teacher. Naomi grew up in the Church and began to volunteer in various ministries throughout junior high and high school. At the beginning of her third year at the UA, Naomi received a call from Corazón Ministries’ Office Manager who told her they were looking for a part time administrative assistant. Naomi took the job and worked for both Corazón and her home church while finishing her degree in English. After only a few short months, Naomi’s job turned from general administrative responsibilities to a more focused role in communications. As the Communications Coordinator, Naomi supports the mission and vision of Corazón Ministries by leading all components of the ministry communications including print, web, and social media. Naomi graduated from the University of Arizona in 2013, and she and her husband, Jonathan Alameda, were married in June of 2014. Naomi supports the mission and vision of Corazón Ministries by leading all components of the ministry communications including print, web, and social media. Janell is a Tucson native and lived in Fortson, Georgia for two and a half years where she met her husband, Daniel. Janell and Daniel married in 1999, and have three children. Janell and Daniel were first introduced to Corazón Ministries at an outreach at Kennedy Park. They started volunteering at the office soon after the outreach, and within a year Janell was asked to work in finance at Corazón Ministries. Janell took a short leave from working after their second child was born and returned to work soon after their third was born. When she returned to work at Corazón Ministries she became the Finance/Office Manager. Janell now works part-time and enjoys working with the staff and the many volunteers who come into the office. Janell and Daniel have enjoyed and been blessed by the many different aspects of the ministry, including one-on-one Bible studies, small group studies, leadership classes and volunteering for outreaches. Janell now mentors and leads a Bible study for 20-something women. Janell now mentors and leads a Bible study for 20-something women.